Are you ready to celebrate a comic book milestone? This July brings the four year anniversary of the ongoing ZOMBIE TRAMP series and the release of its landmark 50th issue!! In today's market not many books make it past the first couple issues, let alone see 50 consecutive monthly issues hit comic book stores, so you know a book is pretty special when it can reach that threshold! To help make things even more special the anniversary issue also features "The Death of Zombie Tramp" event, a year-long storyline that pays off everything the series has been building to, and which will leave the character forever changed! Action Lab: Danger Zone is proud to offer two versions of the book, a normal anniversary issue at the usual page count (but with an extra-length story), and a double-sized 64-page deluxe edition that features all the regular content plus an exclusive cover and backup story from ZOMBIE TRAMP creator, Dan Mendoza! 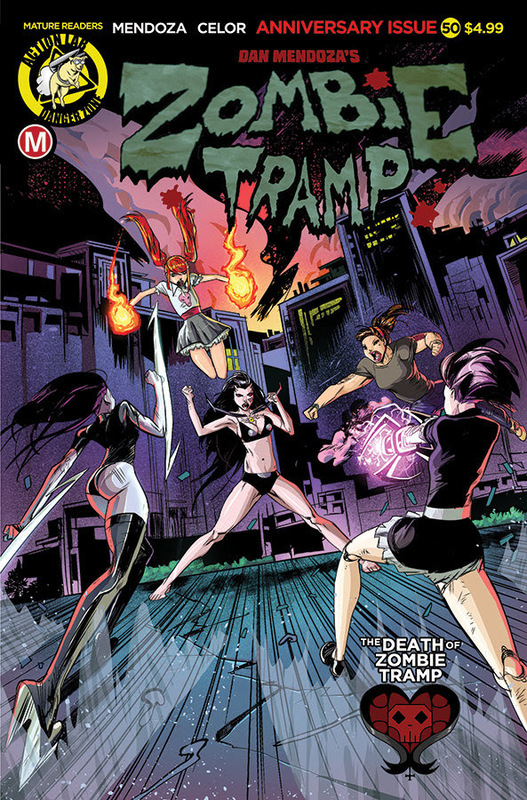 Publisher Jason Martin comments, "ZOMBIE TRAMP started out 10 years ago in a self-published issue by creator Dan Mendoza and it was an instant hit. So I'm not surprised the ongoing series at Action Lab was a smash success. And while those early books now command thousands of dollars on the back issue market, with its bold storytelling and talented and expressive team of artists, ZOMBIE TRAMP will continue to be a creative force for years to come! It's truly an honor to be a part of our own little corner of comic book history. Here's to the next 50 issues!!" Plus the Danger Zone booth at San Diego Comic-Con will feature many exclusive ZOMBIE TRAMP 50th issue celebration items you won't want to miss (more info to come)!